Vacation rental apartment. Sleeps 4, 1 bedroom, 1.5 bathrooms. Dogs allowed. Entry area with work desk. Note vaulted ceilings in most areas. Another living room view to entry stairway in background. Entire apartment is airconditioned. Fully equipped kitchen with all of the tools and appliances to make your breakfast, lunch or dinner while in residence. All 100% brand new! Another kitchen view, all stainless and ready to cook. Tile floor. KIng master bedroom with original oil painting art and the same type of bed used at the New York Ritz. Luxury linens too! Another view of the luxury King bed in the bedroom. Talk about comfortable. View of Master bedroom looking toward the luxury bathroom and laundry down insuite hallway. View of laundry with bathroom in background. Separate soaking tub and tile shower. Main bathroom soaking tub and luxury tile shower. Guest half bath is off entryway. 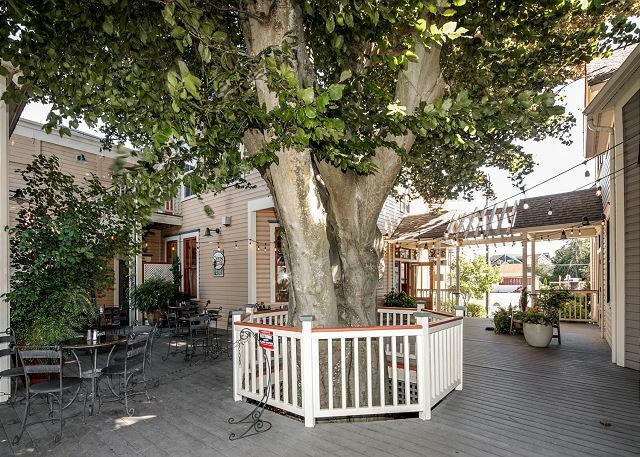 Tillinghast complex courtyard with 1800's vintage Beach tree and Seeds Bistro nearby for your dining pleasure. This unit is the entire upstairs of this building. Another view of this classic complex. The center buildings are from the late 1800's, with new buildings on each end done in 2005, with the same materials and style as the original buildings. . The Tillinghast Seed Company of La Conner retail/apartment complex. Served by large parking lot behind with dedicated space for this unit. Seeds Bistro is downstairs in the complex for your dining pleasure. 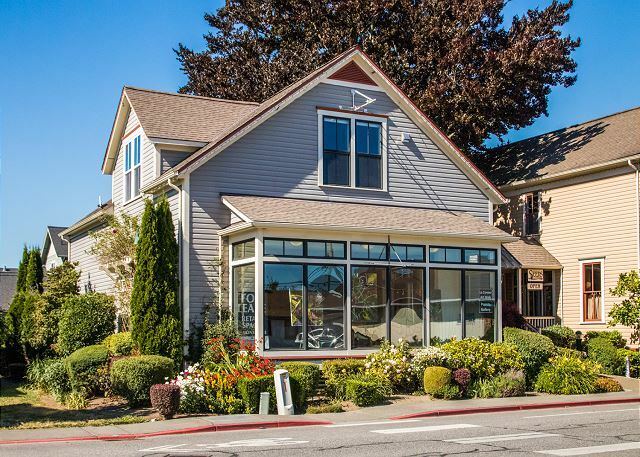 TULIP FESTIVAL SPECIAL PRICING STARTING MARCH 15 THRU APRIL 30, $159/NIGHT SUNDAY THRU THURSDAY, $195/NIGHT FRIDAY AND SATURDAY. As part of the original 1800's Tillinghast property in La Conner, located adjacent to the popular Seeds Bistro and an easy walk to downtown La Conner, this just-completed upstairs, one-bedroom 1 1/2-bath luxury apartment is now being offered for vacation rental. • Luxury Queen sleeper sofa in Living Room. 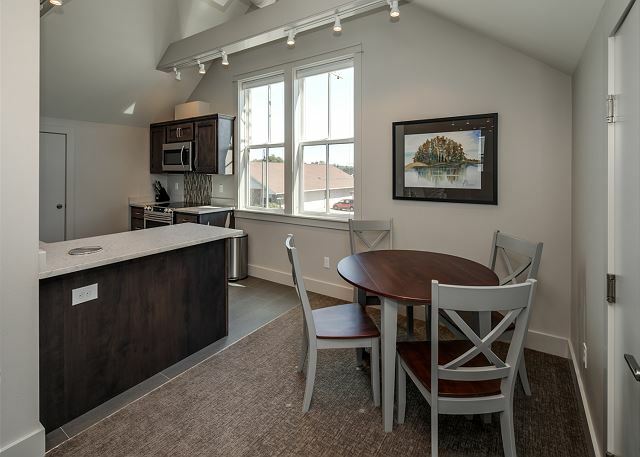 • High-end kitchen includes all stainless appliances including glass top stove with large self-cleaning oven. • French-door stainless refrigerator with ice and water through door. • Master Bathroom includes tile floor, soaking tub, plus separate tile stall shower, double vanities in quartz countertop. Second bath is half-bath for guests. • Luxury carpet throughout, including living room, dining area, halls and master bedroom. • Art work throughout including original oils, historic pictures of La Conner and other northwest scenes. 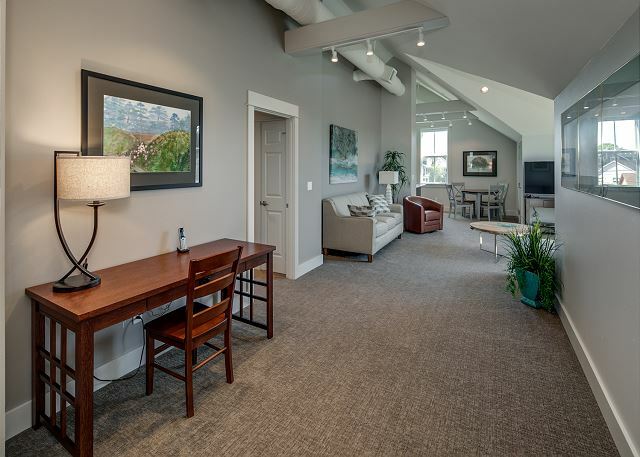 • High-vaulted ceilings throughout with up and down lighting from cross tie beams in ceiling as well as wall sconces. • 55” Ultra HD television with streaming video ability and normal broadcast television services and local news. • Master bedroom features king bed with extraordinary Simmons Beautyrest "Heavenly" bed mattress, as seen in the highest-end national luxury hotels. • All linens and towels are of luxury level material. • Master bedroom has shades for privacy and blackout curtains. • Quiet central forced air heat and air conditioning. But, the real fun will include a walk to La Conner's iconic downtown. We booked this and the other Tillinghast unit for our clients and they loved it! It was perfectly situated near our office as well as everything else in town! Thank you!